Don Reitz (1929 – 2014) was one of the most virtuosic throwers the field has ever seen, the foremost leader of the workshop circuit, a charismatic educator and man of exceptional warmth, kindness and generosity. In 1981 he was named one of the top twelve world’s greatest living potters by Ceramics Monthlyreaders. Reitz earned his MFA at Alfred University in 1962, where he began experimenting with salt-glazing, a technique largely neglected by the post-World War II ceramic studio movement. Readily embracing this firing technique, Reitz quickly realized that it allowed the clay to keep its natural character, and its malleability did not obscure the creator’s hand. In a decade’s time, he was dubbed “Mr. Salt” by his peers. 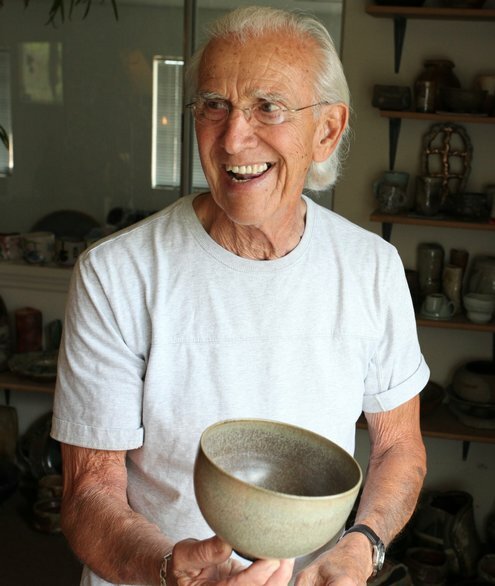 He spent many years as an educator as well as a potter; he taught at the University of Wisconsin-Madison for more than 25 years before retiring as a professor emeritus in 1988. His extensive body of work is represented in over 50 distinguished public and private collections. Don Reitz lived and worked in Clarkdale, Arizona. He claimed that he would have been a poet but for dyslexia and his inability to process language. This redirected him toward visual art where he found his voice in clay. Reitz’s art is his legacy, and through constant reinvention and originality, he extended the definition and potential of the ceramic arts.